Season : All year round! Join us on our Wild Dolphin Safari! Swimming with dolphins in the wild is incredibly magical. Our ability to instantly connect with these curious and playful marine mammals, on their terms, is so powerful and transformative. The more energetic we become, the more animated the dolphins are in their responses. If we twist and twirl and dive, the dolphins will follow suite, mimicking our every move like a pantomime. Its like dancing with someone you’ve met long ago; it feels so familiar and pure, like being a child again. You cannot miss this experience! 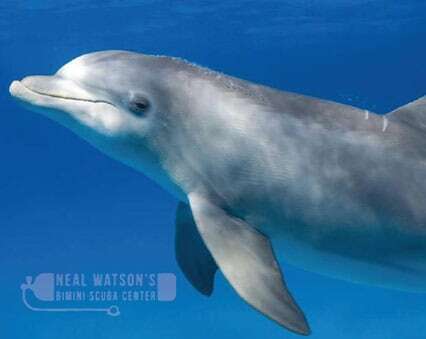 The Atlantic Spotted Dolphin is the most curious and playful of all the marine mammals in The Bahamas. On our Wild Dolphin Safari, we travel north past the Bimini Islands to the western edge of the Great Bahama Bank where these animals are most often found. Ranging in depths of 15 to 30 feet of water, the white sand bottom makes for an incredible contrast to the crystal clear water. Once a pod of dolphin find us, they enjoy surfing our boat wake and often giving us an impromtu acrobatic performance. When the time is right, we get into the water and play with these spotted beauties. The more energetic and excited we become, the more they respond. It is certainly an experience not to be missed! Exact departure and arrival times will be chosen by the captain and are dependent on weather and tides. The average Wild Dolphin Safari runs from 1pm to 5pm. Welcome to Bimini Scuba Center! Guests should arrive at least 15 minutes before the scheduled departure time. Drinking water will be provided on board, but we strongly recommend bringing along snacks and/or lunch. It’s time to start looking for dolphins! Once a pod of dolphin find us and they are comfortable and engaged, divers will be invited to enter the water. The quieter you slip in, the better your chances become for keeping up! Listen to the captain’s instructions, as he/she will guide swimmers throughout the dive, telling them what the dolphins are doing and giving great tips for a fantastic interaction! We always dive until everyone’s had memorable interaction! All prices subject to 12% Government VAT tax. We HIGHLY recommend purchasing DAN Trip Cancellation Insurance for all Neal Watson’s Bimini Scuba Center’s activities and dive packages offered. This insurance is backed by DAN & TravelGuard and pays in the event of your trip being cancelled or delayed due to weather, airlines and a host of other reasons.